A husband and wife can really make magic together: Desi & Lucy had a hit show, Sonny & Cher sang timeless songs, and Siegfried & Roy keep their on-stage chemistry going because one's got a tiger in the sack. 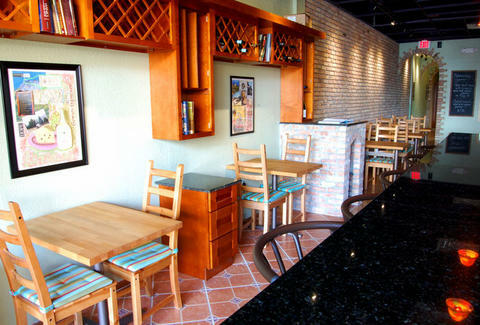 For a resto from a couple who met in the biz, hit up Il Mercato Café and Wine Shop. Run by a husband (sommelier) and wife (chef) team who met when he came in to get a post-shift drink at the bar she was tending, Mercato feels unfancy and welcoming, with rustic terra cotta and brick walls, a granite-topped 10-seat bar, and sturdy farmhouse tables, serving what the chef calls "eclectic American cuisine with worldly overtones" while supporting the slow food movement -- mostly because it makes things soooo much easier to catch. The menu starts with apps that mix up the old and new worlds, with selections like steamed clams and calamari with grilled fennel, pancetta, and tomato; braised pork belly with hominy, radish cilantro salad, and red chili sauce; jerk chicken with corn flan and mango slaw; and a group of interesting sides such as polenta fritters, and peas and hominy, which is what we all hope for some day. Main courses come in either half or full portions, with standouts including a semi-boneless half chicken with spaetzle and a Riesling jus; a grilled hangar steak with cottage fries and gorg pepper sauce; porchetta-style roasted pork shoulder (deboned and rolled with layers of herbs and spices); and grilled mahi with fennel salad, an orange reduction, and a three-bean mash, also a wartime medical comedy in which nobody's got any problems with their hearts. The wine shop fuels the resto's vino choices, and they also offer an unprinted "Other Wine List", which delivers a selection of pricier bottles upon request that's ever-changing, just like Roy's feelings on tigers.